Please use certified 18Gbps HDMI cables, not exceeding a maximum length of 15ft, with this item to guarantee performance. This is extremely important, particular for Dolby Vision application. This is the newest generation of HDMI audio extractor for optical / SPDIF output and analog headphone stereo output. True HDMI 2.0b 18Gbps full bandwidth for 4K Ultra HD at 60Hz, HDR and HDCP 2.2 generation of HDMI displays and signal sources. It is backward compatible with the earlier generation of HDMI devices. The optical audio output supports incoming HDMI audio signal formats up to DD+ (Dolby Digital Plus), DD & DTS 5.1CH, 2CH LPCM. The 3.5mm stereo headphone output supports incoming HDMI audio format up to 2CH LPCM, headphone output does not support incoming HDMI audio format higher than stereo. 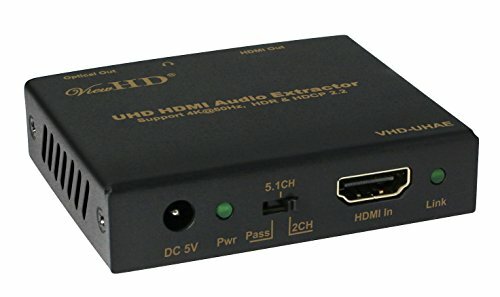 HDMI output signal is identical to HDMI input signal. This VHD-UHAE model does not support ARC, for ARC please check the VHD-UHAE2 or VHD-UHD4X1A model. Additional Note: Support Sony PS4 Pro, works well with 4K / HDMI 2.0 sources, such as: Sony UBP-X800, LG UP970, Samsung M8500, Roku Ultra, AppleTV 4K & Chromecast Ultra etc.